The panorama across Eskdale from Ill Crag. Harter Fell and Hard Knott can be seen, also a small tarn. The Lake District, also known as The Lakes or Lakeland, is a rural area in north west England. It is a popular vacation area, famous for its lakes and its mountains and its associations with the early 19th century poetry and writings of William Wordsworth and the Lake Poets. It is on a tentative list of UNESCO World Heritage Sites. Lake District National Park (created in 1951) is one of the fifteen National parks in the United Kingdom. The Lake District is about 34 miles (55 km) across (north-to-south or west-to-east). It is entirely within Cumbria, and is one of England's few mountainous regions. All the land in England higher than three thousand feet above sea level is in the Park. Only one lake in the National Park has the word 'Lake' in its name, namely Bassenthwaite Lake. 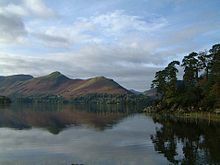 All the others such as Windermere, Coniston Water, Ullswater and Buttermere use other forms, such as 'mere' and 'water'. The major lakes and reservoirs in the park are given below. The word 'tarn' is a local word used to describe any small lake that may otherwise be called a pond. Yan Tan Tethera - the name for a system of sheep counting which was traditionally used in the Lake District. Though now rare, it is still used by some and taught in local schools. ↑ UNESCO, "England's Lake District"; retrieved 2012-4-19. This page was last changed on 14 November 2017, at 09:22.